OUR WORLD IS CONSTANTLY CHANGING SO OUR LANGUAGE NEEDS TO CHANGE TOO. I THINK THAT LANGUAGE IS VERY INTERESTING. I LOVE THAT NEW WORDS EVOLVE TO MEET OUR NEEDS. THE OED (Oxford English Dictionary) MADE SELFIE THE WORD OF THE YEAR. THEY TRACK LANGUAGE USE ON THE INTERNET. THE WORD SELFIE WAS USED LIKE CRAZY IN 2013. MANY NEW WORDS ARE COMBINATIONS OF WORDS. SHMEAT COMBINES SHEET AND MEAT TO MAKE A NEW WORD TO DESCRIBE ARTIFICIAL FOOD. WORDS LIKE THIS CRACK ME UP. AUTHORS OF A BOOK ON FUTURIST LANGUAGE HAVE COME UP WITH A BOOK WITH NEW WORDS THAT DESCRIBE MODERN LIFE. MONOPHOBIA IS THE FEAR OF BEING AN INDIVIDUAL. I THINK THIS IS A GREAT WORD TO DESCRIBE MANY WHO BLEND IN WITH EACH OTHER. TIME SNACK IS A WORD USED TO DESCRIBE THE TIME IT TAKES FOR A COMPUTER TO PROCESS INFORMATION. Creative Writing: Imagine you are a futurist writer! Think about our modern world and the words we need. THE MODERN WORLD IS SO FAST. WE NEED TO THINK OF WAYS TO SLOW DOWN, SPEND MORE TIME TOGETHER AND RELAX. THE WORDS I WOULD CREATED WOULD ENCOURAGE THIS. SIT DOWN WITH SOMEONE YOU LIKE AND HAVE A “RELACHAT“. THIS IS A RELAXED CHAT WHERE NO ONE IS IN A HURRY. ANOTHER WORD IS “CERETALK“. THIS MEANS TALKING ABOUT SOMETHING CEREBRAL. THIS IS MY FAVORITE THING TO DO! 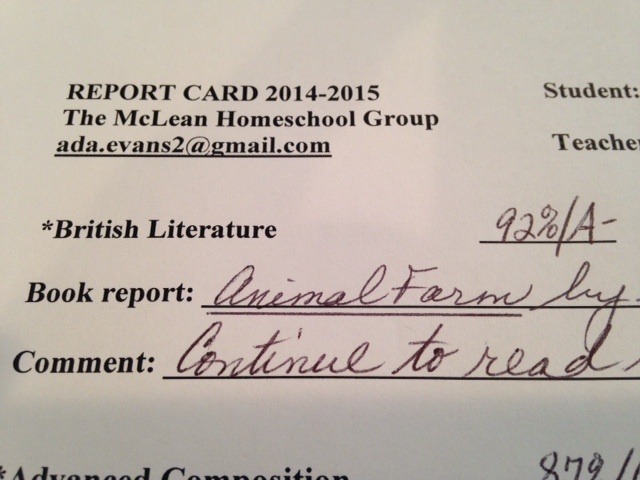 Today was James’ last day of school and he received his first “real” report card! His A- grade in British Literature was just the icing on the cake of an amazing month and year. 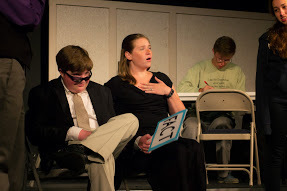 In May James participated in the McLean Homeschool Group annual pageant which is a night of student performances including musical, dramatic and literary readings. 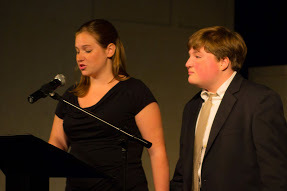 James and Shannon presented his essay on Pilgrim’s Progress and he also had a part in a very funny skit! (Both are pictured above). He is writing a blog post describing his pageant experience but it is not finished yet. 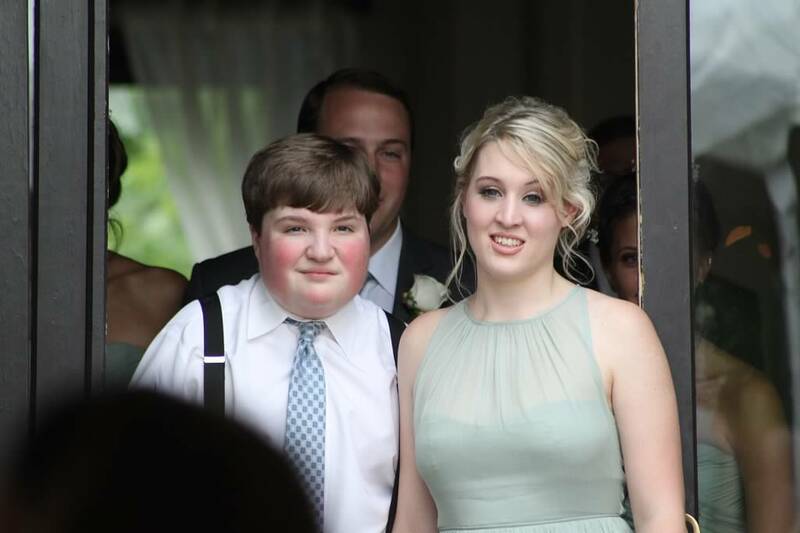 And last but not least James was a groomsmen again, this time for his brother Joe. It was amazing to see what a difference a year has made in his maturity and bearing. He has worked hard on his self control and it really shows. When I write I am always thinking about those readers who have children with autism. I want you to know that we never dreamed James would be living the life he is now and it just gets better and better.